sear | What Am I Eating? Pork tacos for my employees today. I insist on serving them pork even when I know plenty of leftovers always end up going to the mission on our donation days. I love pork so much, I can’t help but try to bring others to my side with a spicy, shredded pork taco, or a tender sandwich oozing barbecue sauce. Funny how many of them don’t eat “swine” (as my banquet manager says!). Religious, cultural or vegetarian reasons prevent so many people from partaking of my favorite meat. I try to share my love of pork with as many people as possible, but so many resist. I really don’t eat much meat, and except for a really great burger, I can usually do without cows. However, I can’t imagine life without a juicy, brined and seared pork tenderloin, still slightly pink on the inside. Whether sweet and salty, with a tart-sweet fruit sauce, salsa or chutney, or thinly sliced with homemade cilantro-lime aioli on a whole wheat roll, it always leaves my taste buds dancing. 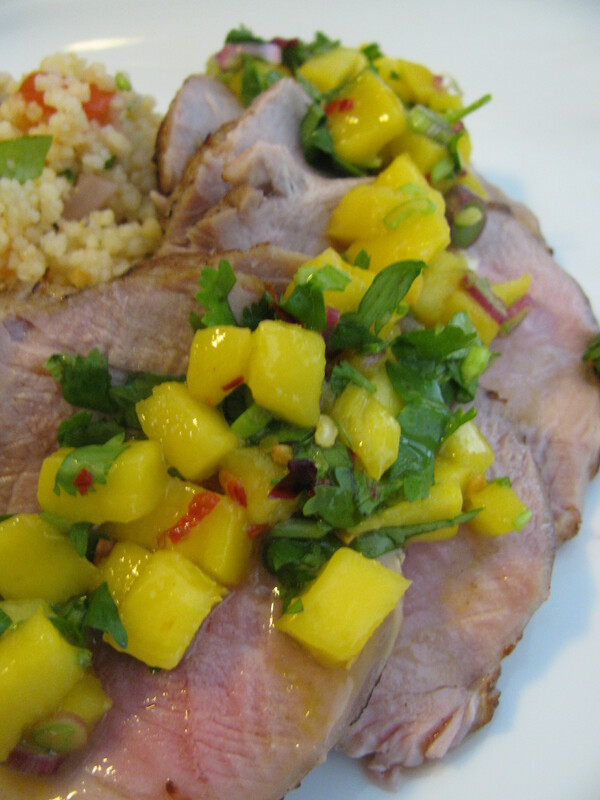 Most recently, my favorite cut of meat shared a plate with a fresh mango salsa and wonderfully quick couscous. A popular combination that I never tire of, though the type of fruit I use varies with the season. If you can find a local or organic pork tenderloin, grab it while you can, and enjoy one of my all-time favorite dishes. 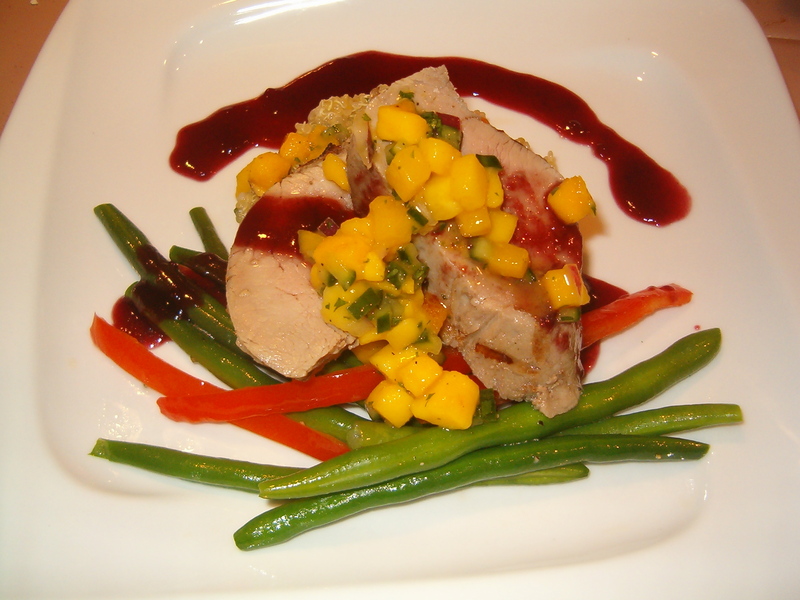 Another version of pork tenderloin with mango salsa I did a couple of years ago. I told you I love this combination! Combine all ingredients, stirring well until salt is dissolved. Place the pork in a large container and cover with the brine. Marinate in the refrigerator for 6 to 8 hours, but no more than 12 hours. More than this will cause a chewy texture and an ultra-salty piece of pork. Remove the pork from the brine and dry it off gently with paper towels. Season the pork with salt and pepper. Heat a large, oven-proof sauté pan over medium high heat. Add a small amount of olive oil to the pan. Make sure the pan is very hot, it should be almost smoking, but not quite. Add the pork gently, with tongs, being careful not to splash any oil. Leave it along for a couple of minutes, until you can start to see the pork browning. You want a nice, golden brown color. Flip the pork carefully, and cook the other sides until it is evenly browned. Place the pan in the preheated oven, and cook for 10 to 20 minutes, or until the internal temperature reads 145 degrees. I prefer my pork still slightly pink in the middle, but not bloody. Let the pork rest for 5 to 10 minutes before slicing to allow the juices to redistribute. Serve immediately. I like to turn any leftovers into sandwiches, with homemade aioli or barbecue sauce and any veggies I have lying around. Just thinly slice the meat and serve any way you wish. Also great in tacos! Also great with pineapple instead of mango, or add some red bell pepper or cucumber, or anything else that sounds good to you! Have fun and experiment. 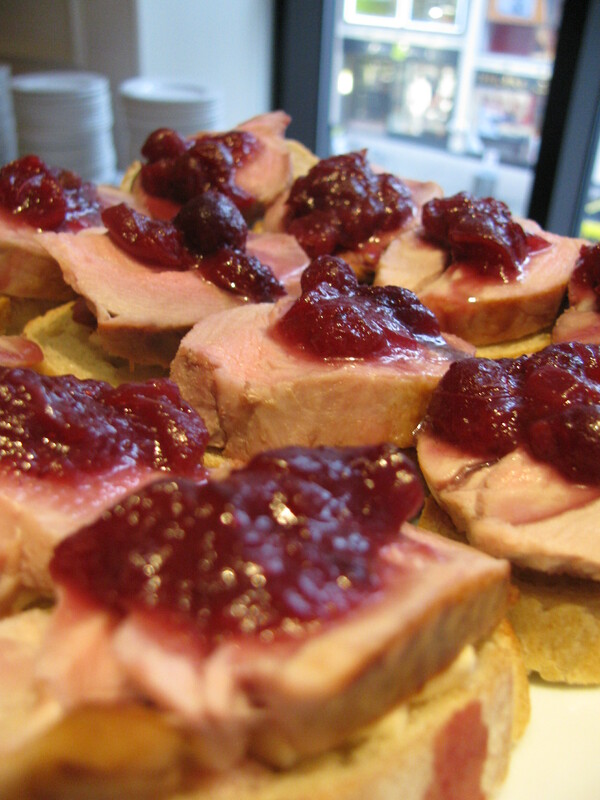 And an appetizer version I made at work with cranberry chutney.